The Era of Self-Service Analytics Emerges: Inside SAS Visual Analytics and Visual Statistics | Constellation Research Inc.
SAS Says Business Intelligence Users Can Tap Advanced Analytics, But Which Approach Fits Your Firm? Business leaders want to see what’s coming, not just read reports on what happened last week or last quarter. That’s why there’s intense interest in predictive analytics. Predictive and statistical techniques have been a staple for insurance companies and big banks for decades, but more recently they’ve gained adoption in many other industries. Spurred on by the success of the self-service business intelligence movement, vendors are moving into self-service analytics. 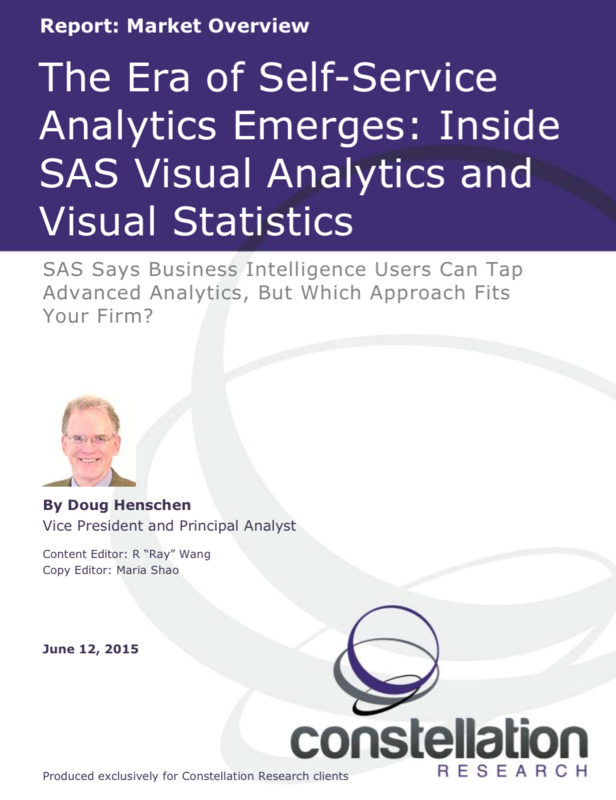 SAS Visual Analytics and Visual Statistics are products leading the trend. SAS Visual Analytics and Visual Statistics are the vendor’s next-generation BI and analytics tools with drag-and-drop and point-and-click interfaces. Recently combined into one product, VA/VS includes many of the automated data-prep, visualization and predictive modeling recommendations seen in other tools. Nonetheless, this is an advanced product and it is best suited to analysts and data-savvy users. While there are many choices out there, your best-choice product will depend on the breadth of your deployment, the skill level of your users, and the nature of the decisions users are trying to support. Keep in mind that collaboration with data experts is desirable, as novice users need guidance and support in order to turn data into valid insights and better decisions. Advanced analytics represent a class of software that helps companies go beyond historical reporting to predict future opportunities and risks. Predictive analyses help identify best customers, develop better up-sell and cross-sell offers, understand financial risks, choose new products, and anticipate equipment failures. Until recently, advanced analytics were the province of statisticians and data scientists, but that’s changing with the emergence of self-service options for analytics.